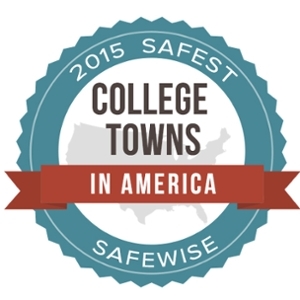 Southern Illinois University Edwardsville is set in one of the “50 Safest College Towns in America,” according to the 2015 SafeWise Report. Edwardsville, a city of approximately 24,650, ranked number 25 on the list of 50 towns. SafeWise security experts coupled FBI crime statistics with research on safety-related programs and initiatives to determine the rankings. SIUE’s launch of the Rave Guardian app was cited as an example of the University’s commitment to safety.